I think almost everyone has an old cell phone lying around that you need to get rid of or use. With this post I wanted to share an easy way to change your old cell phone into a video baby monitor! As you may know, they sell video baby monitors in the store for quite a bit of money (usually $100+). I had heard from a friend that you could use an old android phone as a baby monitor, so I began searching the web for directions. I found this blog about how it can be done. All you need is an old android cell phone (not sure if this will work for an iPhone, but you can view the feed on an iPhone) that has a camera and wifi capabilities…and of course you need wifi in your home. You can then link this camera to your android, iPhone, iPad, or even Kindle to watch (and listen) to your baby for about $4.00! You will download the IP Webcam app to your old cellphone for free (note: this does NOT need to be an activated cell phone). Then you can either download the IP Cam Viewer (Free – no sound) or the IP Cam Viewer Pro ($4.99 – sound and video). I followed the blog listed above to set up my camera and I have been using this monitor ever since! This is great for when you are busy around the house and want to still know what is going on as your baby naps. Also, this is great at night or during naps to see if they are waking up or just making a little noise in their sleep. My sister even tried it out on my two year old niece to make sure she didn’t get up while napping upstairs. 😉 Of course, you want to make sure the cord is not within the reach of your baby. Initially I had the camera hanging on the side of the crib, but as my son became more mobile I moved it out of his reach to the dresser near his bed. 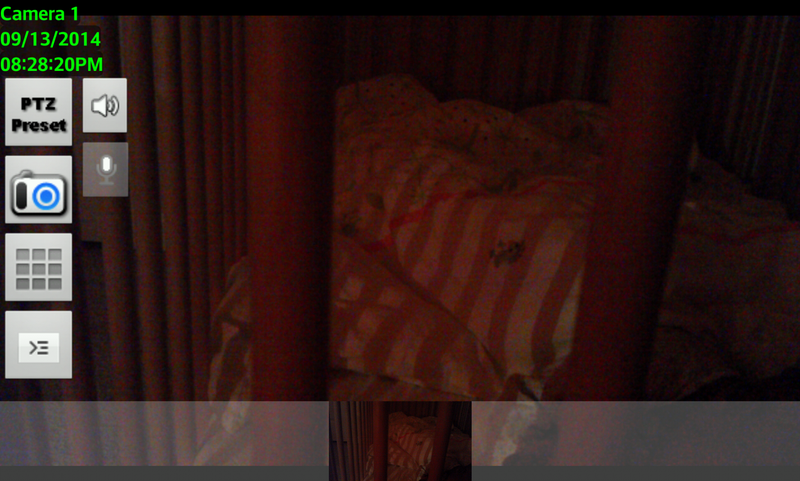 Here is an image of the camera while horizontal with the lights off in my son’s room. He has a small light in his room that provides some light. If there is NO light in your child’s room you will NOT be able to see on the camera. Also, you can remove the side and bottom bars for a better view, but the date and time will remain. Since this camera works off your WIFI, no one can view your baby without the code to your WIFI. If you have questions about setup let me know!